FEUP is ready for WikiSym 2008! What about you? Get ready too! Welcome to the conference wiki for WikiSym 2008 - the 4th International Symposium on Wikis, Porto, Portugal, September 8-10. 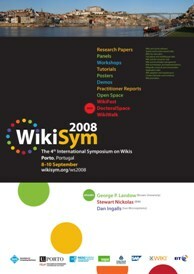 WikiSym is the foremost conference devoted to using, developing and researching wikis. In our fourth year, only WikiSym brings together organisations that use wikis to meet face to face with leading and emerging vendors, active researchers and leading wiki consultants. WikiSym 2008 explores and extends our thriving wiki community, building on the past 4 years to again bring together researchers, practitioners, and technical writers to gather, discuss, share best practices and develop knowledge . Meet Whether you are new to the wiki industry or you've been using and developing wikis for the best part of a decade, WikiSym is a great place to meet participants from the disparate sectors. Learn Come and visit to hear about our research papers, practitioner reports, workshops, panels, posters and demonstrations, and tutorials. 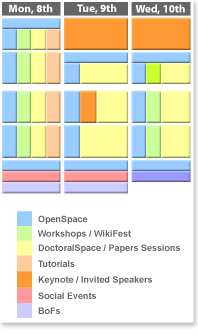 Share Even if you are not presenting, come and develop your opinion by participating in our informal but lively OpenSpace and WikiFest sessions. We encourage everyone involved with wiki research, development, and use to contribute to WikiSym 2008! WikiSym 2008 will be held in Porto, Portugal, one of Europe's most ancient cities. FEUP - Faculdade de Engenharia da Universidade do Porto will host WikiSym 2008. Porto is well served by international flights and discount air carriers, making it readily and economically accessible. Famous for its wine, its medieval quarters, and its storied history, Porto will make a superb venue for a WikiWalk. You can watch and contribute to the public area of this wiki. skype: a public channel for WikiSym participants. More WikiSym related announcements can be found on the WikiSym blog. This page was last modified 08:07, 3 September 2008.